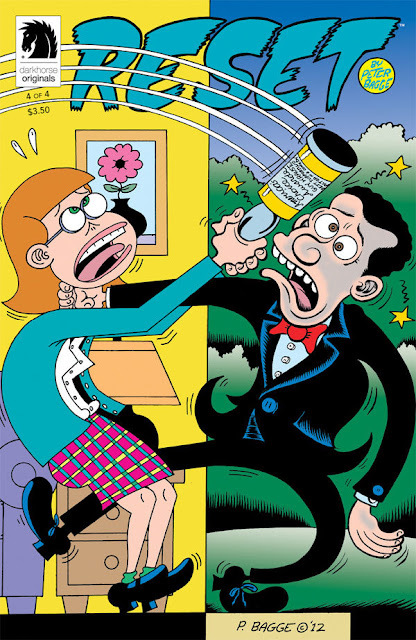 Like many people, I grew up reading Peter Bagge's seminal comic book series, Hate, and the various adventures and exploits of Buddy Bradley. This was eye-opening stuff to an adolescent, and along with Clowes, Ware and others, it cemented a love for comics that has extended to present day. I grew to think of Seattle as Bagge depicted it, and - in conjunction with his appearance at The Word on the Street (September 28th to 30th) - we asked him for his "Top Slop." First off, let me apologize for not listing my top three Vancouver eateries. I can't recall ever having a bad meal while up there, but I simply don't visit often enough to even recall any of their names! Meanwhile, not only is my home town of Seattle going through an explosion of excellent restaurants (what city ISN'T these days? ), but even my home NEIGHBORHOOD of Ballard has become a foodie mecca these past few years. There's WAY too many choices for me to limit it to just three places! Instead I decided to limit it to 3 places within easy walking distance (i.e. : 15 minutes) of my own home. I'm not exactly in the heart of Ballard, but more on the outskirts, where the pickin's are slimmer but still plentiful, and where the choices keep improving. Speaking as a typically snobby ex-New Yorker, one thing Seattle -- make that the rest of the CONTINENT -- never gets right is how to make a decent New York Style pizza. It has everything to do with the crust: something about NY's tap water, apparently. At least some folks gave up trying and started making truly excellent Roman style pizza instead -- known for its thin crust and cooked quickly at super high temperatures. Seattle's four Via Tribunale's came along first, and they do a fantastic job, but Brandon Pettit upped the ante (IMO) when he and his wife, food blogger Molly Wizenberg (of Orangette), opened up this perfect little off-the-beaten-path place miraculously close to my own home four years ago (this area was a foodie desert previously). Delancey quickly became a trendy destination spot -- and was unfairly criticized by some because of it -- but has always been worth waiting for a seat (the ONLY place I'd say that about, being notoriously impatient). They've also thankfully stuck to their simple menu, though they've recently opened up a next door called Essex with its own excellent small plate menu. These folks REALLY know what they're doing, folks! An unadorned, stand-alone former butcher shop (appropriately), with their own smokers grinding away in the back parking lot. I'm generally not a huge barbecue sauce fan, since it's usually way too sweet for my taste (I don't like a lot of SUGAR in my main courses). Thankfully, Pete's offers the LEAST candy flavored bbq sauces I've ever had, and the meat itself is incredibly tender. Their portions are also enormous, so you better be in a major meat-eatin' mood when you go there! It's a perfect place for lunch, though they have live music in the evenings as well. Owners Eric and Julie Reinhardt have a real passion for what they do, as evidenced by Julie's own blog, She-Smoke. Another simple, unadorned, inexpensive place specializing in Lebanese food. This place is located in the forlorn little corner of a business district where good restaurants go to die, so I sure hope this place ends that trend. The food is incredible, and has a lot of excellent vegetarian choices to keep my veggie daughter content. Owner and chef Rajah Gargour also has a very non-Middle Eastern passion for whiskeys, particularly rye whiskey, and he'll generously let you sample some of his most recent finds if you ask. My kinda guy! Peter Bagge's new series, Reset, is published by Dark Horse, and we've got the entire set to GIVE AWAY. To enter, let us know your favourite Bagge comic or Seattle haunt in the comments. Remember: if you win, we can't contact you unless you leave some way for us to do so. Contest ends at 11:59PM PST on September 23rd, 2012. UPDATE: CONTEST IS NOW CLOSED. THANKS!